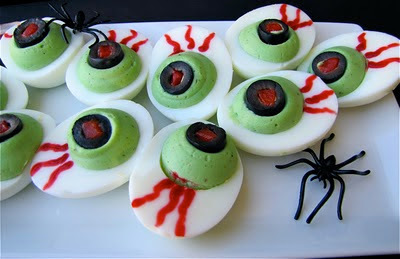 The Halloween fun continues today on Susi's Kochen und Backen with a couple more ghoulish treats. Earlier this week I featured fun drinks like "Swamp Juice" and appetizers like "Eye of Newt" and today is no different with a couple more fun party foods like "Vampire Blood Shots" and "Puff Pastry Intestines". Now, who wouldn't want to come to THAT party? When trying to come up with a themed party my planning always starts with the food. A good mix of finger food is easiest to serve, since it allows your guests to walk around and be social. I like to have a good mix of cold and warm appetizers, some that contain meat and some for all the vegetarians . If in doubt, a vegetable platter, cheese tray or fruit platters are always a hit and they can round out your buffet. One of my big requirements for "fun" food is that it has to be appealing to the eye as well as the taste buds. 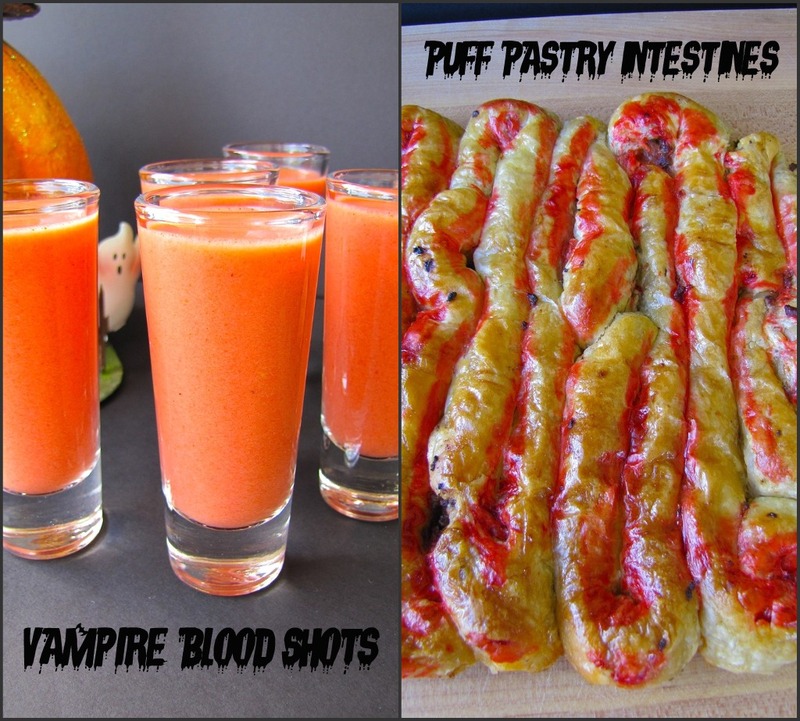 Kicking it off today are the "Vampire Blood Shots". Now, I need you all to humor me and pretend that I'm serving these fun shooters in Test Tubes rather than shot glasses. I had ordered a test tube set to display them in, but of course, I'm still waiting for them to be delivered. Plan B to the rescue. While not quite as cool looking as test tubes, serving the "Blood" in shot glasses works just as well. The blood happens to be a very quickly cooked, but incredibly tasty tomato soup that can easily be made a day ahead. Since tomatoes aren't at their prime anymore, I went with a couple of cans of whole tomatoes which are always flavorful and at their best taste. A smooth soup is key when you are serving it "drink-style" and with that I relied on my food mill to get the right texture. A fine mesh strainer will do the job as well though. 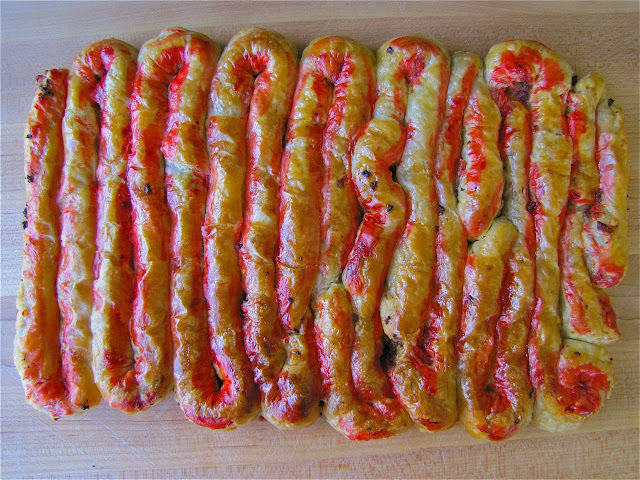 Second up are the "Puff Pastry Intestines". I found them on The Knead for Speed who had adapted it from canarygirl.com and the second I laid I eyes on this fun treat I was hooked. My boys coming home from school, seeing them on the counter and exclaiming "most awesome guts EVER!" confirmed my excitement. They are pretty simple to make, all you need is a bit of time. Puff Pastry is cut into strips, filled with a meat filling, then pinched together to form one long continuous roll before being placed in a 9 x 13 inch pan (here is a great tutorial). Red food coloring adds a bit of gore. The puff pastry sheets were pretty easy to work with in the beginning, only towards the end it became difficult and started to fall apart on me when transferring to my baking dish. Not a big deal though since intestines aren't all that neat anyway. This recipe can also be made ahead and refrigerated until ready for baking. They are great fresh out of the oven but still tasty at room temperature. I hope you all enjoyed the recipes featured this week on my blog. I figured with so much candy around and more treats and sweets to come in the next couple of months, it would be fun to show a different food side of Halloween. 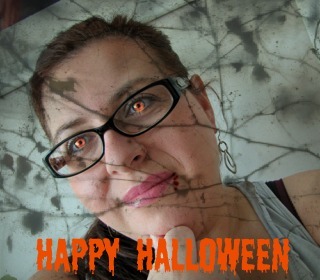 Since I'm trying to get ready for this weekend, I'm wishing you all a Happy Halloween at this point! Enjoy yourselves, whether you are hosting a party, going to a party, or simply getting into the fun by handing out candy to all the little ghosts and goblins out there. See you next week! In a large pot heat olive oil over medium heat. Add onion and cook until translucent. Add the whole tomatoes and crush with a potato masher. Add the bouillon cubes, salt, pepper, sugar, basil, oregano and cook covered for about 15 minutes. Pour mixture through a food mill, discard solids or alternatively pour mixture through a fine mesh strainer, making sure to press all the liquid out of the mixture. Return strained soup to the pot. Check for additional seasoning. Add the heavy cream and balsamic vinegar. Serve immediately or refrigerate until ready to use and re-heat. Thaw puff pastry according to package directions. Preheat oven to 400 degrees F and line a 9 x 13-inch baking pan with parchment paper. Cut each puff pastry sheet lengthwise into 6 strips. Lightly flour a big work area, table, or kitchen island and lay each strip next to one another. (I did 4 strips at a time) Press and seal the seams between the strips. Spread the filling down the entire length of the dough, leaving a bit of space on each side to pinch closed. Pinch the entire length of the dough closed, stretching the dough slightly around the filling as you go. Carefully lift intestine into your baking dish, seam-side down, and form an "intestine-like" pattern. Brush puff pastry with beaten egg. Dip small paintbrush into red food coloring and draw "blood" in the creases. 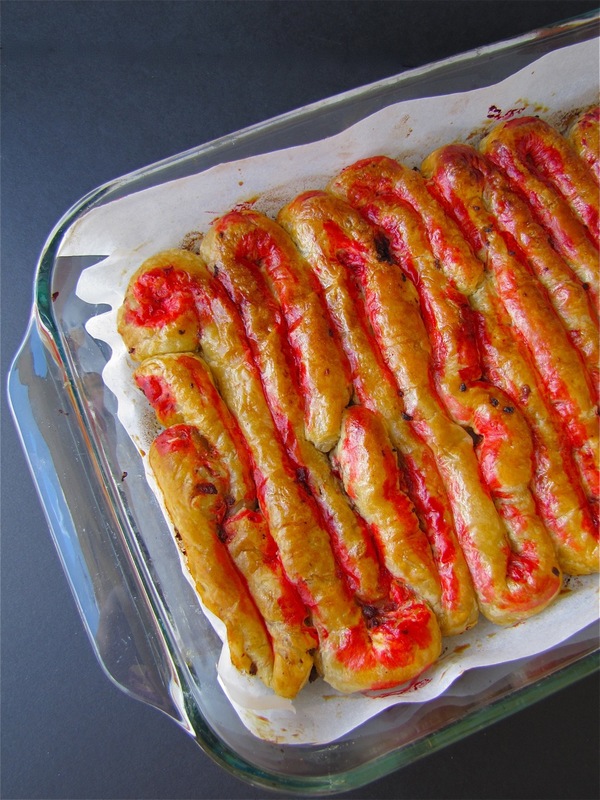 Meat Filling for "Puff Pastry Intestines"
Brown meat in a pan until no longer pink. Add onions, corn, taco seasoning, water and ketchup. Cook for about 5 minutes or until water is dissolved. Let cool before filling the puff pastry. 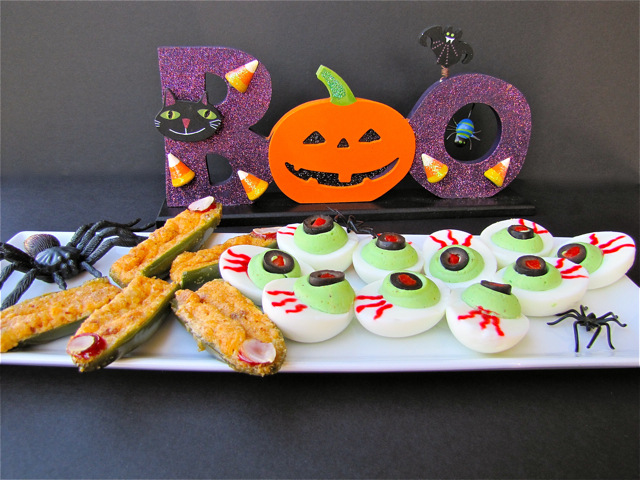 Finger Poppers and Eye of Newt to your favorite ghouls when stopping by for a visit. 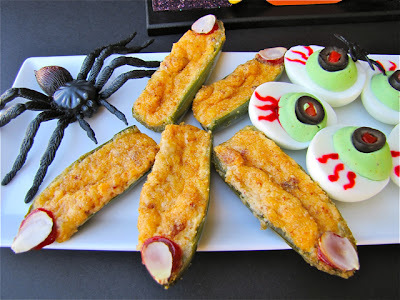 Witch Finger Poppers are, according to my husband, one of the best jalapeno poppers around and I've been fixing them for many years. What sets them apart from a regular deep fried version is that they are baked and with that, at least a little bit better for you. 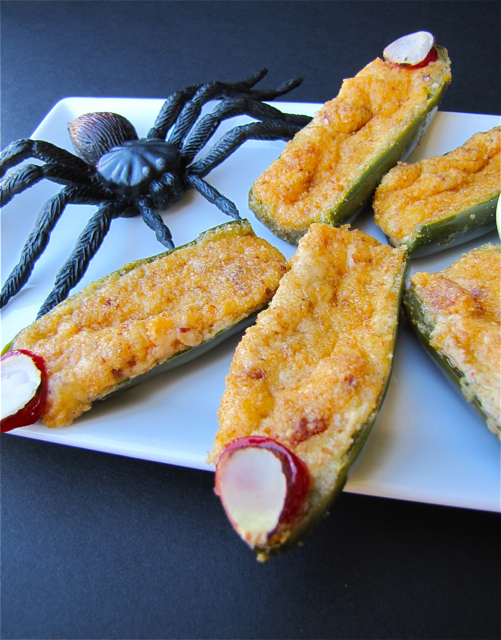 Seeded and halved jalapenos are stuffed with a filling of cream cheese, cheddar and Monterey jack cheese, bacon and seasonings before being dipped in breadcrumbs. Ketchup and a sliced almond complete the grizzly witch fingernail effect. The poppers are then baked for about 30 minutes before serving. Just make sure to cool them a bit before biting into them, unless you are going for the "skin burned off the roof of your mouth feel" (been there, done that, got the t-shirt). 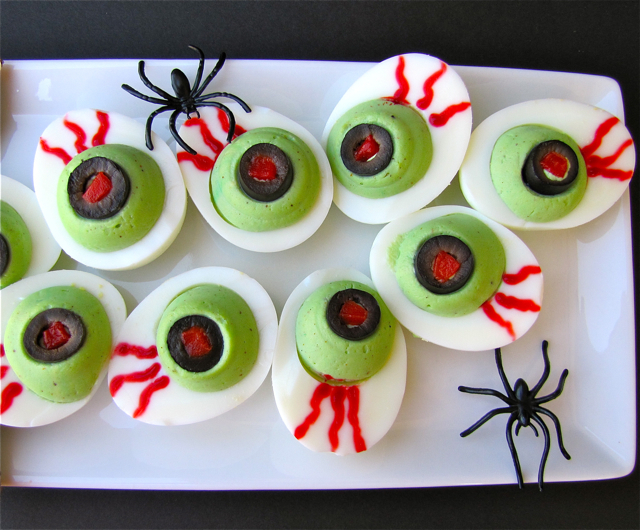 Eye of Newt is a fun take on my Snappy Deviled Eggs which are a staple at our house as well. This time around the filling gets its "moldy" color from blue, green and yellow food coloring before being piped into the egg halves. A sliced olive along with a sliver of pimiento make up the pupil and finally gel food coloring applied with a toothpick to the white part of the egg add the finishing touch to the "Eye of Newt". 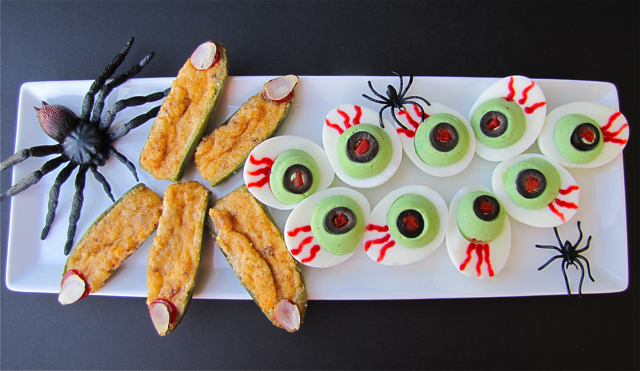 Both of these appetizers add hilarious touches that make your Halloween buffet just a little more ghoulish. Depending on how many goblins you have coming by this year you might want to go ahead and double the recipes as they never last long! - You can make the Witch Finger Poppers the day before your party. Just seed and fill the peppers. Place in baking pan and cover with plastic wrap. Set in refrigerator until ready to bake. - Make the Eye of Newt the morning of your party but wait until a couple of hours before your guests arrive to apply the red food color, otherwise it will "bleed" into the white of the egg. In a large mixing bowl, combine the cheeses, bacon and seasonings. Spoon about 1 tablespoon into each pepper half. Dip tops of stuffed peppers into bread crumbs. Place a small amount of ketchup at the end of each popper; top with a sliced almond to resemble a fingernail. Place in a greased 15 x 10 inch baking dish (make sure to pack them in tightly or the filling will run out). Bake, uncovered, at 300 degrees F for 25-30 minutes or until golden brown. * When cutting or deeding hot peppers, use rubber or plastic gloves to protect your hands. Avoid touching your face (trust me on this!). Peel and halve hard boiled eggs lengthwise and remove yolks. Place yolks in a bowl along with mayonnaise, sour cream, mustard, vinegar and hot sauce. With the immersion blender mix everything to desired consistency (you can use a fork and mash if you don't have a blender). Season with salt and pepper. Color egg yolk mixture with blue, yellow and green food color until desired color is reached. Pipe egg mixture back into egg halves. Garnish each egg halve with 1 sliced olive, 1 diced pimiento placed inside the olive. Add red food coloring with a toothpick for the blood-shot eye effect. Stay tuned for more ghoulish treats on Thursday! Candy Corn Cordial and Swamp Juice. Say what? Halloween is without a doubt one of my husband's favorite holidays. Of course my kids love it as well, but that is a given considering the bags of candy they always drag home. I, on the other hand didn't know about Halloween until I met my husband. It wasn't celebrated in Germany, even though I've come to find out that it is starting to become a custom for many people there as well. Over the years, and probably in part because of my kids and husbands enthusiasm, I have come to love this holiday just as much. 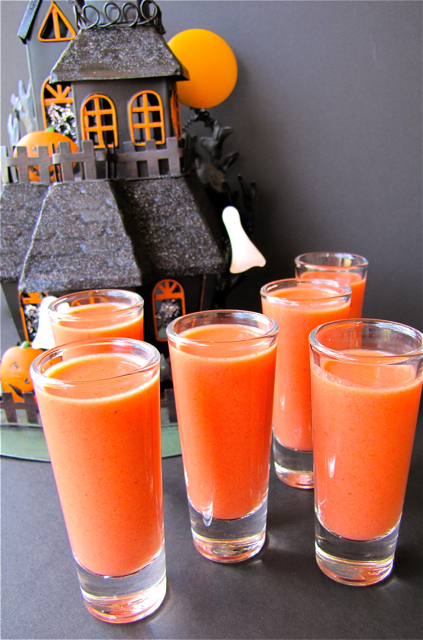 Join me this week as I'm featuring "howl-worthy" recipes for kids and adults alike. Maybe you are still looking for a few ideas to put the finishing touches on your own Halloween party or maybe you are just looking for fun. In any instance, I'm hoping you enjoy some of these holiday treats! I'm kicking my Halloween week off with a couple of drinks. One is for all the adults and the other is for the kids, designated drivers, or those that like a good swamp juice. Either way, they are a great way to get your party started. 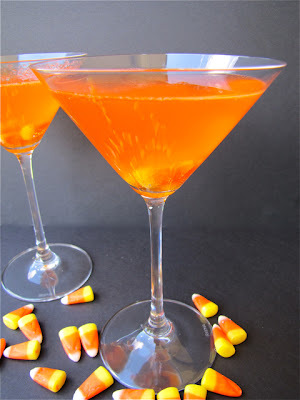 First up a candy corn inspired cordial that is certainly beautiful to look at and even better to sip. 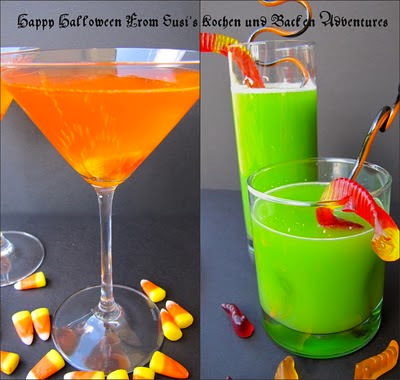 Vodka is infused with candy corn for a few hours which imparts the great color scheme. Your vodka won't be tasting exactly like candy corn, but it will add a good amount of sweetness. The colored liquor is then mixed with Grand Marnier, lemon juice and a splash of lemon-lime soda for a bit of fizz. Next up is the green tinted swamp juice. This drink is a hit with kids and adults alike. Lime jello is dissolved in hot water before being mixed with pineapple juice, orange juice concentrate and lastly a splash of ginger ale. Yellow and blue food coloring assure the perfect color and while I usually don't advocate artificially colored food, Halloween is one of the few exceptions I make. 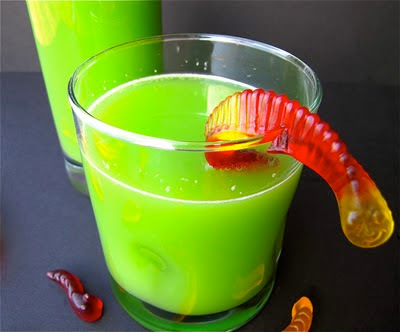 Decorate these drinks with gummy worms or go ahead and freeze little gummy critters in an ice cube tray and drop them into your swamp juice for a "gross" affect. Both of these drinks are easy to make ahead. Making a big pitcher or punch bowl will free up your hands and makes it easy to mingle instead of playing bartender. All that's left to do when your guests arrive is the splash of soda. 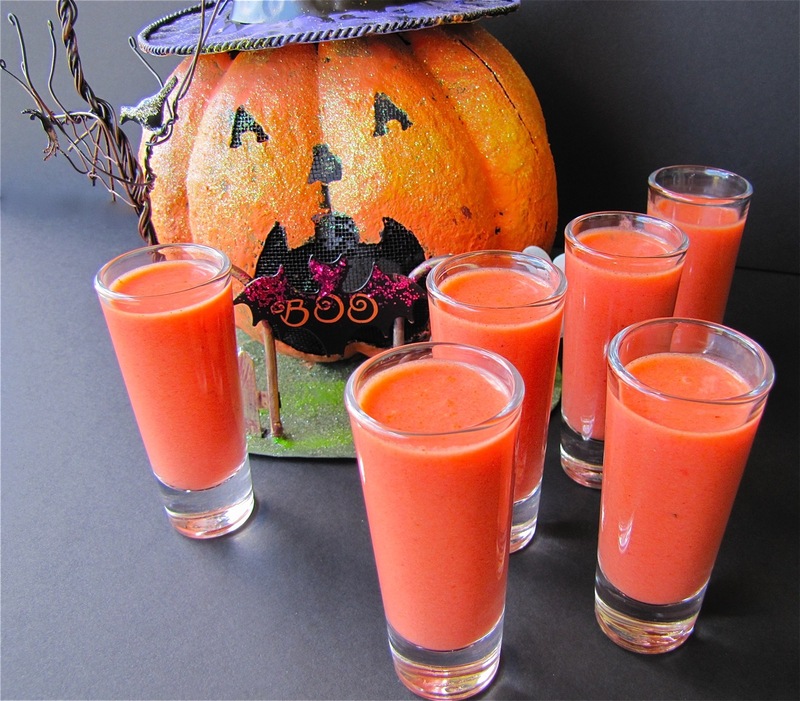 Even if you are not planning a party this year, you might be able to surprise your loved ones with one of these drinks and get everyone involved into a ghoulish mood! Make the cordials: Combine the infused vodka, orange liquor and lemon juice in a large measuring cup, add a splash of lemon-lime soda and stir. 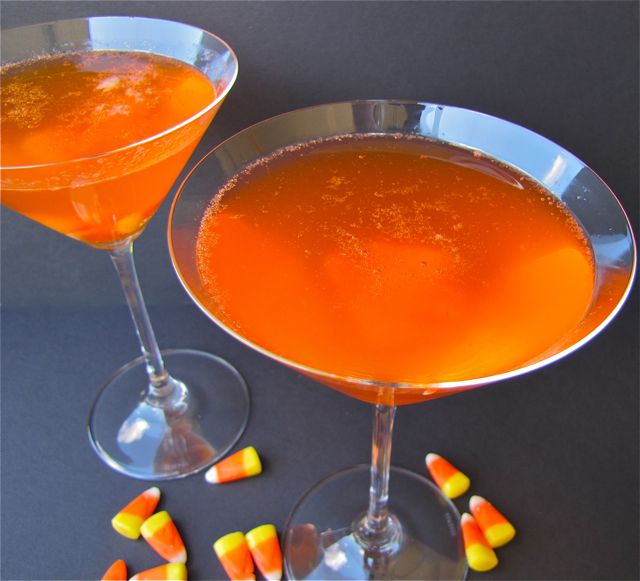 Pour into chilled martini glasses and garnish with candy corn. Dissolve gelatin in 1 quart of hot water. Allow to cool. When gelatin is cool, pour into a large punch bowl. Stir in pineapple juice, orange juice concentrate and cold water. Add food coloring (if desired) until preferred color is reached (start with a couple of drops of each). Pour in ginger ale just before serving. 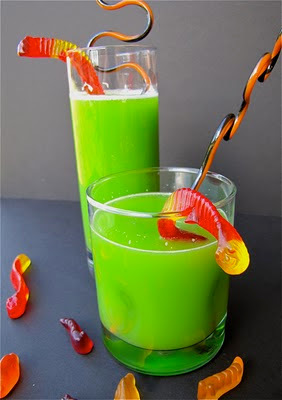 Garnish with gummy worms. Kooky Girl from Always Tri-ing My Best and Elisabeth from food and thrift finds both tagged me in this fun "get to know more about me" game that is making the rounds on a lot of blogs. I figured you all might enjoy "learning" a bit more about me. Since I'm supposed to be tagging 8 bloggers as well, this is a great way to find out about some other great blogs you may have not been aware of! 1) What do you most enjoy about blogging ? The part I enjoy most is probably the whole process of cooking or baking something and see it take shape. The kitchen is almost like my sanctuary, the place I can go to when I need to clear my head by doing something that requires my whole attention. But a close second is certainly meeting so many incredibly nice people. 2) What is your personal achievement or moment that sticks in your mind and why ? Without a doubt giving birth to my 3 children. They are, and always will be, my greatest personal achievement! 3) What is your favorite party drink ? Margarita's baby, but a nice Cosmo will work as well! 4) If you could go on holiday tomorrow, where would you go ? I'd like to say Germany, but since it is cold and rainy there according to my mom and sisters, I think I would probably pick Australia since it is spring there right now. 5) What is the most unusual ingredient in your store cupboard right now ? Hmmm, not really that unusual but I do have a bottle of Prickly Pear Jam in there. 6) What do you do in your 'free' time ? What free time? Seriously, three kids, two dogs, a blog, friends, etc. etc. and you get the picture, but if I do get a minute I like to go out for a nice dinner with my husband to re-connect. 7) What is the name of the last restaurant you went to ? House of Tricks with our amazing friends Sharon and Steve! One of the best meals of all-time! 8) What is your favorite style of cooking to eat out (rather than cook yourself) ? That's pretty easy to answer: Sushi!!! I love sushi and I don't think I would ever try making my own in a million years. 1) What is your all time favorite comfort food? That's tough since I like so many different things that are comforting, but if I had to chose one single thing, it would be my mom's creamed potatoes with boiled beef and her homemade dill pickles. I've never attempted to cook it myself and always request it when I visit Germany. No one can make it the way she does! We didn't usually have lunch at school in Germany, it was eaten at home. We did have a couple of breaks in the morning, but they were only about 15 minutes long. My standard lunch was a broetchen (like a Kaiser roll) or a sandwich (made with a sturdy rye bread) with butter and some kind of a lunch meat. That and an apple was usually my mid-morning snack! 3) What is your favorite all time cooking show on T.V... past or present...and why? Again a tough one! I love Tyler Florence, so probably "Tyler's Ultimate". I love watching him take an ordinary dish and transforming it into something extraordinary! 4) Which celebrity, famous person, or famous chef, would yo invite to your next holiday party in your home, and why? I would love to have dinner with Tyler Florence. He seems like a real down to earth guy that would enjoy a nice homemade meal. 5) Which holiday you love the most? Christmas without a doubt! I love shopping for my family and enjoy the whole season that comes along with it, from the baking and cooking, to the decorating. To me there is nothing better than enjoying the season with my loved ones. The kids look forward to certain cookies and dishes all year and I try to make it extra special by incorporating my German customs. It makes the kids feel special and I hope all of this creates the best of memories for them! If I could chose right now it would probably be Tuscany, but only if I could take my husband. 7) What kind of food you absolutely hated, growing up, as a young child, or teenager. Funny question, but I absolutely hated raw tomatoes! I think I was a young adult before I started eating them. 8) What was the most dreaded dish that you prepared and said you would never prepare it again? Very early on in our marriage I made some deviled crab dish from a recipe on the back of imitation crab meat package and it was probably the most disgusting thing ever. I ended up tossing it. 1) What is your favorite kitchen tool to use? 2) What is your all-time favorite dessert? 3) What cooking show would you love to be part of? 4) If you could travel to any country just for the food, which one would it be? 5) Is there a food you can't stomach, no matter how often you've tried it? 6) What is your most treasured recipe? 7) What is your best kitchen tip? 8) With the holiday's approaching, tell us about a food you must have on either your Thanksgiving or Christmas dinner table! Sometimes the best laid plans simply don't work out. Today's post was supposed to be this well planned out apple dessert, but the dessert gods weren't in agreement and I decided to switch gears yesterday. Looking for inspiration in my kitchen my eyes caught four very ugly looking bananas sitting on the counter. Now you all know the story, sometimes you can't buy them fast enough and then there are times when no one touches them at all. I actually think there is some kind of conspiracy going on in my house. I wouldn't be surprised if my family made a pact to let bananas go bad every once in a while just so I can come up with a dessert. I knew I didn't want to make a cake or banana bread, so I went to one of my most used cookbooks, Martha Stewart's Cupcakes for inspiration. While a couple of them sounded pretty good, none of them struck a chord, so I just took one of Martha's recipes and fiddled with it until I had what I thought was a pretty darn good cupcake. I used her Banana Pecan cupcake recipe as my starting point, but not being in a nut kind of mood I started thinking of things I could replace them with. Looking through my pantry it struck me, butterscotch chips and bananas = match made in heaven. 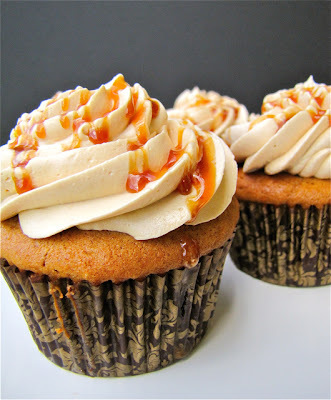 For the frosting, I stuck with the suggested caramel buttercream, I mean why mess with a good thing, right? Before I started baking, I scaled the recipe down to half. With so many treats being baked lately I knew I didn't need 30 cupcakes hanging around. The original cupcake batter called for light brown sugar, which I realized I was out of after I had started putting things together. Well, dark brown sugar it was and that turned out to be a great decision. The batter is made quickly and goes into the oven in no time, where it will make your house smell out of this world while baking. After cooling the cupcakes, they are frosted with the most delicious buttercream known to man (fair warning here, for all of you spoon frosting eaters). 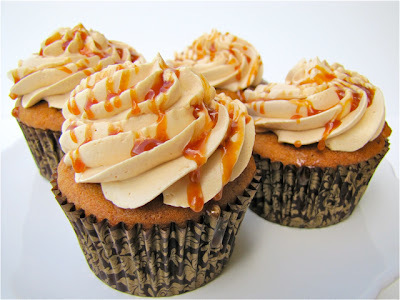 And finally (since we didn't have enough decadence yet) I drizzled the finished frosted cupcakes with even more caramel. Good lord, I might have had to take a cold shower after eating one of them. I usually prefer chocolate over all things caramel, but these cupcakes gave chocolate a run for their money. Pure bliss! These will be made again without a doubt. I'm glad I had to change dessert directions at the last minute, but this ended being one of my favorite cupcakes this year! For the cupcakes: Preheat oven to 350 degrees F. Line standard muffin tins with paper liners. Whisk together cake flour, baking soda, baking powder, slat, and cinnamon. In another bowl, whisk together mashed bananas, buttermilk, and vanilla. With an electric mixer on medium-high speed, cream butter and brown sugar until pale and fluffy. Add eggs, one at a time, beating until each is incorporated, scraping down sides of bowl as needed. Reduce speed to low. Add flour mixture in two batches, alternating with banana mixture, and beating until just combined after each. Stir in butterscotch chips. Divide batter evenly among lined cups, filling each three-quarters full. Bake, rotating tins halfway through, until a cake tester inserted in centers comes out clean, about 20 minutes. Transfer tins to wire racks to cool completely before removing cupcakes. For the caramel: Combine sugar and water in a heavy saucepan. Heat over medium heat, stirring occasionally, until sugar is dissolved and syrup is clear. Stop stirring, and cook until syrup comes to a boil. Continue to boil, gently swirling pan occasionally to color evenly, until mixture is very dark amber. Remove from heat; add cream in a steady stream (the mixture will spatter), stirring with a wooden spoon until smooth and combined. Let cool. 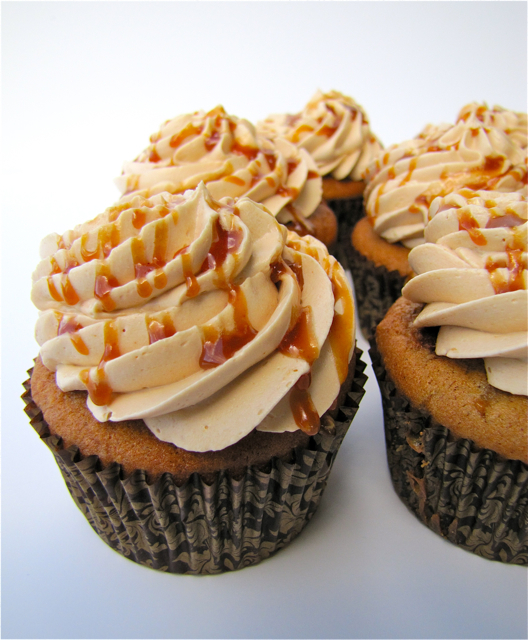 For the caramel buttercream: With an electric mixer on medium-high speed, cream butter until pale and fluffy. In the heatproof bowl of a standing electric mixer, combine 1/4 cup sugar and the egg whites. Set bowl over a pan of simmering water; whisk constantly by hand until mixture is warm to the touch and sugar has dissolved (the mixture should feel completely smooth when rubbed between your fingertips). Attach bowl to the mixer fitted with the whisk attachment. Starting on low and gradually increasing to medium-high speed, mix until stiff (but not dry) peaks form. Continue whisking until egg mixture is fluffy and glossy, and completely cool (test by touching the bottom of the bowl), about 5-10 minutes. Reduce speed to medium-low. Add beaten butter, a couple of tablespoons at a time, mixing well after each addition. Mix in vanilla. Switch to the paddle attachment. With mixer on medium-low speed, very slowly pour in caramel; beat a couple of minutes. Scrape down sides of bowl, and continue to beat until caramel is fully incorporated. Putting it all together: Frost cupcakes by using a small offset spatula to spread the buttercream or fill a pastry bag (fitted with the tip of your choice) with the cream and pipe on. 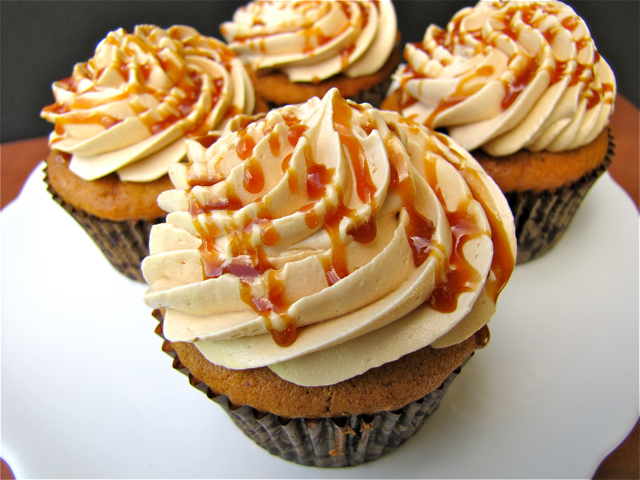 Drizzle with additional caramel (you should have some leftover). 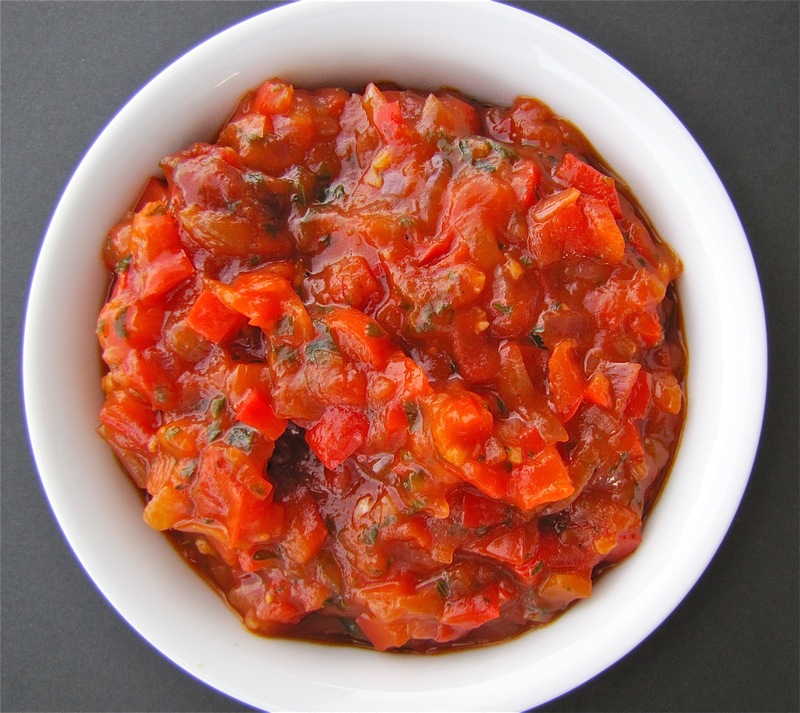 Refrigerate up to 3 days in airtight containers; bring to room temperature before serving. Meatloaf can garner strong reactions from a lot of people. In my experience, there are two camps, the ones that love it and always have, and the other ones that loath it, and think it's one of the worst foods ever invented, reminding them of awful cafeteria food. I tend to think that most people who have that preconceived notion have never tried a good meatloaf recipe. In fact, I would bet that today's featured recipe would convert them all into meatloaf lovers. Thankfully, our family likes meatloaf, even though there have been a few hits and misses over the years. Anything from sickeningly sweet glazes to plain under-seasoned and bland concoctions. 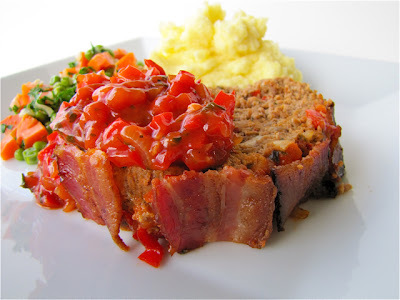 And while no one ever complained much, we didn't know what a truly fabulous meatloaf should taste like until I came across Tyler Florence's version. To us, this is the "ultimate" meatloaf that everyone looks forward to when it's on the menu. 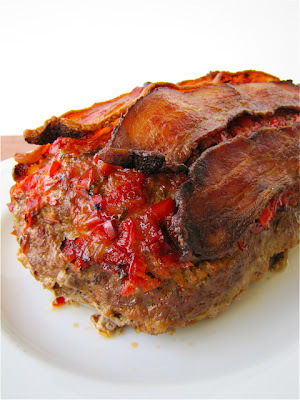 What makes this meatloaf so incredibly tasty and unique is Tyler's use of a homemade Tomato Relish both inside the "meat dough" and also as a glaze. The relish is not hard to make but does require a bit of planning ahead, since it is best not to incorporate the hot relish into your meat. In the past, I've made the relish a day ahead of time and stored it in the refrigerator until ready to use. The meatloaf itself does not call for a lot of fancy ingredients, but does use a mix of ground beef and ground pork. I usually use 93% fat free beef with the pork and the meatloaf turns out perfectly moist, but certainly feel free to use whatever you are accustomed to. Soaking the bread (which is your binder) in milk prior to adding, assures additional moisture in the loaf. And last but certainly not least, the meatloaf is covered with bacon before baking. I mean, come on, there is no way you can go wrong with this recipe at this point. I'm only advising you to use the thick-cut bacon, which can withstand being baked for 1 1/2 hours without shriveling into oblivion or turning to sawdust. This meatloaf has truly been a family favorite for many years and since it finally cooled down to the low 90's last weekend, my kids have been begging me to make this. There is no way I would attempt turning my oven on for this amount of time in the summer, but this ended up being the perfect weather. I always serve this dish with homemade mashed potatoes and a vegetable on the side. This time my youngest chose my Peas and Carrots "German Style" which I have featured on my blog before. So if you like meatloaf or even if you've been on the fence about it, I'm urging you to give this very special recipe a try. It makes for an awesome Sunday dinner with loved ones! For the tomato relish: Coat a skillet with a 2-count of oil and place over medium heat. Saute the onion, garlic, and bay leaves for a few minutes to create a base flavor. Throw in the red peppers and cook them for a couple of minutes to soften. Now add the tomatoes; adding them at this point lets them hold their shape and prevents them from disintegrating. Stir in the parsley, ketchup, and Worcestershire; season with salt and pepper. Simmer the relish for 5 minutes to pull all the flavors together. Remove it from the heat; you should have about 4 cups of relish. Let cool. Place the torn white bread in a bowl and dd the milk to just barely cover, swish the bread around in the milk and let it sit while you get the rest of the ingredients for the meatloaf together. Lightly oil a cookie sheet (I lined mine with foil that I oiled). Transfer the meat mixture to the center of the cookie sheet and form into a log about 9 inches long and about 4 inches wide. Coat the top of the meatloaf with another 1/2 cup of the tomato relish. Lay the bacon across the top lengthwise. Bake the meatloaf for 1 to 1 1/2 hours until the bacon is crisp and the meatloaf is firm (mine took the full 1 1/2 hours). Rotate the meatloaf while it's baking every now and then to insure that the bacon browns evenly Remove the meatloaf from the oven and it cool a bit before slicing. Serve with the remaining tomato relish on the side. Fall in our house means pumpkins. Carved pumpkins for Halloween. Baked goods with pumpkin. Roasting pumpkin seeds. Watching "It's the Great Pumpkin, Charlie Brown". And last but not least, decorating with pumpkins. The season would just not be the same without the round, orange squash. Autumn also brings cravings for more comfort foods throughout the day and with that, my kids start asking for more cookies, especially around snack time. 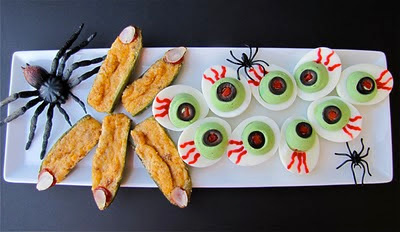 Being the sneaky mom that I am (even though I'm pretty sure my two older ones are on to me) I like to "trick" my kids into thinking they are getting a real treat, when in reality this snack is pretty healthy for them. 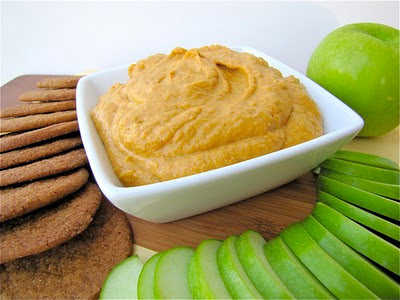 Pumpkin dip falls right into this category, especially when served with plenty of fruit and a couple of cookies on the side. The fruit to cookie ratio is of course much higher, but they don't complain since it is presented in a fun way. The dip is nothing fancy, and can be found all over the internet. I happened to find a version on AllRecipes.com and made a few changes. Instead of regular cream cheese I used a low-fat version (you can't taste the difference in this dip) and also replaced the confectioner's sugar with brown sugar to add a little more flavor depth. Instead of pre-made pumpkin spice seasoning, I just added my own spices until I was happy with the end result. 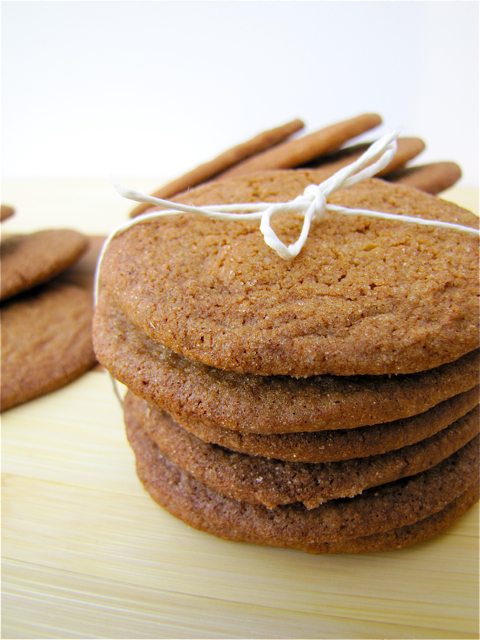 While apples and pears are ideal for dipping, nothing beats these homemade gingersnap cookies. If your experience with these cookies has been like mine (I've only tried them years ago out of a box), I encourage you to try this homemade version. Believe me when I say, you will be hooked and never be able to return to the "break-your-teeth" store bought cookie again. The recipe for these cookies comes courtesy of David Lebovitz who is not just an ice cream genius, but also knows a thing or two about baking. I found the recipe on his website and was intrigued by the use of black pepper in the batter. The cookie dough is made quickly with every day ingredients before rolling the dough into logs and chilling it in the refrigerator. After that, the logs are sliced thinly, dipped in additional sugar (if desired) and then baked. The result was a perfectly, well rounded, subtly spiced cookie, that had crunch but at the same time melted in your mouth. The dip, along with fruit and the cookies are pretty much the ultimate after school snack for my kids who absolutely fell in love with the dip and these cookies. Both of these recipes will be making repeat appearances throughout the season and as far as the cookies are concerned, they have earned a permanent spot as one of my favorites on my cookie list. I hope you'll give either one of these recipes a try, I'm sure there are plenty of opportunities throughout the season! In a medium bowl, blend cream cheese and brown sugar until smooth. Gradually mix in the pumpkin. Stir in the cinnamon, ginger, nutmeg, cloves and allspice until smooth and well blended. Chill until serving! 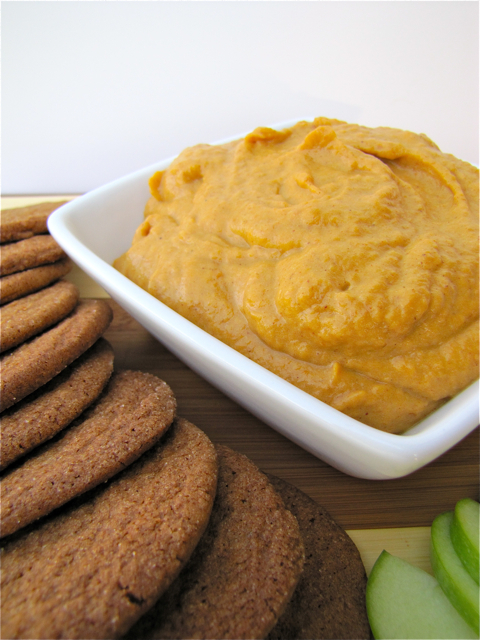 Serve with assorted fruit and gingersnaps! To bake, preheat the oven to 350 degrees F (180C) and line two baking sheets with parchment paper or silicone baking mats. Slice cookie dough into 1/4-inch (a scant 1 cm) rounds with a sharp knife. Dip one side and press firmly in a bowl of coarse sugar if you want (you can also use granulated sugar instead), and place sugar-side up on a baking sheet, evenly-spaced apart. Leave a couple of inches, about 5 cm, between cookies since they’ll spread while baking. I've always been a soup kind of girl. Even growing up, me and my middle sister would fight over leftover soup. My little sister on the other hand despised them and when I mentioned soup while she was visiting she curled up her nose which told me she still didn't care for them. Needless to say, we did not have soup or stew while she was visiting. My immediate family though loves a good bowl just as much as I do, and we make a dinner quite often out of it. With a salad or a sandwich on the side, soup can be a quick and quite satisfying meal. 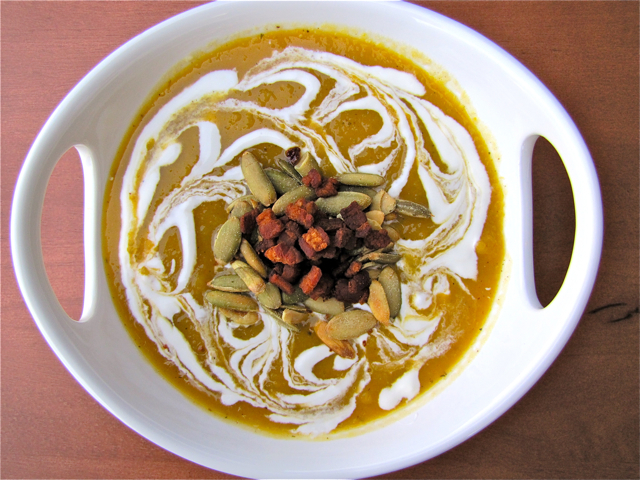 I've tried to make various squash soups in the past, but only to lukewarm reviews from the family, so when I came across the recipe for this roasted butternut squash soup on Tasty Kitchen I wasn't sure how well it would be received. I guess I worried for nothing. 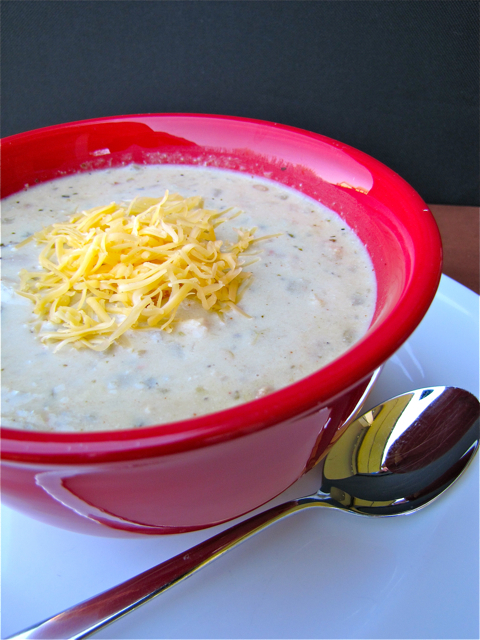 This soup turned out wonderful and I only made a few small changes to accommodate our families taste. The soup starts by peeling and dicing a butternut squash and roasting it in the oven along with a celery, carrot, onions and garlic. After about 20 minutes, a couple of peeled and cut up apples are added to the mix and the roasting continues for another 15 minutes or until the vegetables are soft. The finished roasted vegetables are added to a food processor and are mixed with a couple of cups of chicken or vegetable broth until smooth or the desired consistency is reached. Add honey, sage, salt and pepper and pulse until combined. Meanwhile, bacon gets cooked in a Dutch oven until crisp. The bacon is removed from the pan and drained on a paper towel. All but 2 tablespoons of the bacon grease are drained from the pot and finally the blended vegetable puree is added to the Dutch oven with two more cups of broth. At this point, add more broth until the soup reaches the desired thickness (adding more broth for a thinner soup, or less if you like it on the thicker side). Simmer the dish for another 5 minutes making sure to taste one more time for salt and pepper. 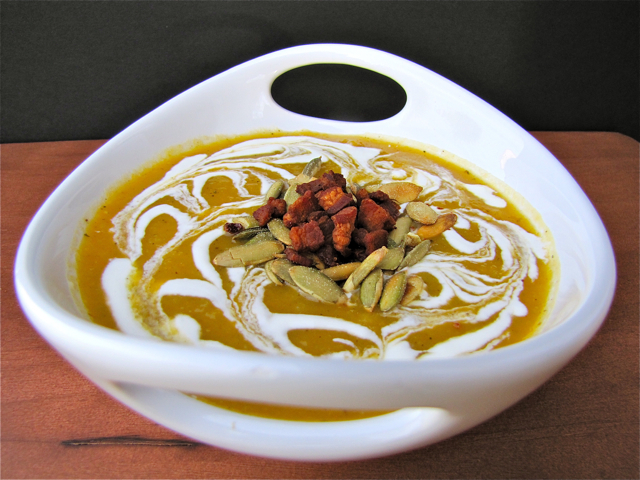 I served this soup drizzled with sour cream and sprinkled with the reserved bacon and pepitas (roasted pumpkin seeds). Trader Joe's sells a good sized bag of pepitas for a decent price, or you can just make your own. 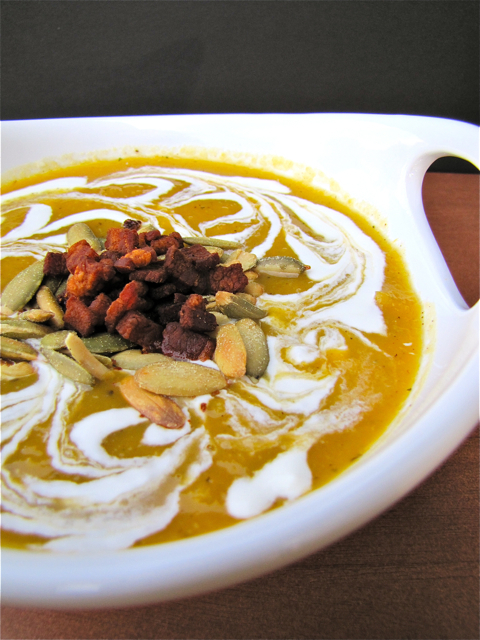 A great fall flavored soup that was incredibly rich and tasty. 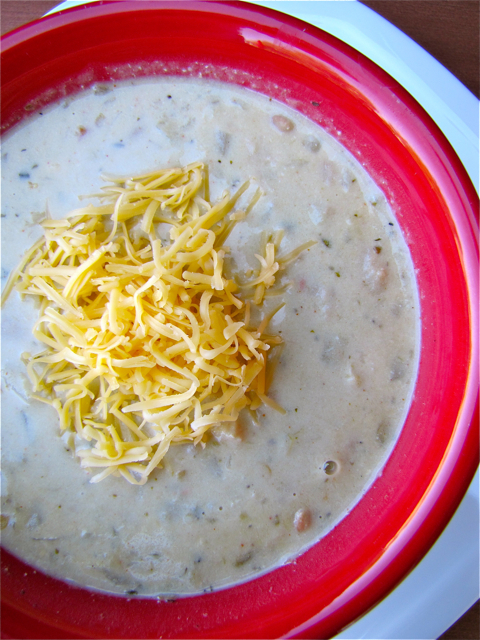 My husband, kids and I loved this recipe, and I know I will be making this soup several more times this season. The soup made the perfect accompaniment to toasted cheese sandwiches, and the leftovers were just as tasty the next day! This recipe would also be a lovely addition for a soup course on Thanksgiving, so be sure to give this one a try! Peel and cut squash into large cubes. Place cubes into a large roasting pan. Add carrot pieces, celery, onion, and garlic. Drizzle with olive oil and add a good pinch of salt. Toss to coat and roast for 20 minutes in the oven. Add the apple pieces to the roasting pan and stir to combine. Return to the oven and roast for an additional 15 minutes or until vegetables are soft. Add vegetable mixture to a food processor and blend with 2 cups of broth until desired consistency is reached. Add honey, sage, 1 teaspoon of salt and 1/2 teaspoon of pepper. Pulse to combine. Set aside. Cook diced bacon in a Dutch oven or heavy saucepan over medium-high heat until crisp. Transfer cooked bacon to a paper towel lined plate. Remove all but 2 tablespoons of bacon fat from the Dutch oven. Add the vegetable puree and two cups of broth (at this point you can add up to two more cups of broth depending on the consistency you are looking for). Taste for salt and pepper and let the soup simmer for 5 minutes. Serve sprinkled with crisp cooked bacon, sour cream and pepitas. I love Fall. It is most certainly my favorite season. I've always loved everything associated with autumn and this hasn't changed over the years. The smells of cinnamon, and other spices, lighting candles, being able to wear jeans and boots, all those things are special to me. I had to give up a few things that I always enjoyed during this time of year by living in Arizona, like the changing of the leaves or dark, rainy days, but even here fall has it's benefits and there is certainly something to be said about sitting around a fire pit on cooler (like 70 degrees F) evenings and finally being able to enjoy the outdoors without melting. One of the things I think of immediately when it comes to fall are apple desserts. I love, any and everything apple and always look forward to being able to come up with new recipes and ideas to incorporate them. Since apples harmonize so incredibly well with all of my favorite spices, you will be seeing quite a few apple recipes over the next few weeks. One of the challenges I face when it comes to apple desserts is that my two older ones don't care for the texture of traditional apple pie. With this in mind, I tend to look for recipes that incorporate the apples in a way so that my kids don't complain. Dorie Greenspan once again to the rescue. 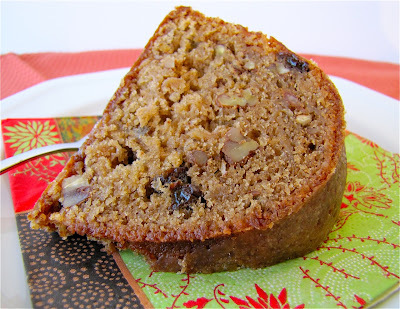 This recipe caught me eye right away because it was a pretty economic cake that only required what I already had in my fridge and pantry. The cake gets double the apple flavor by incorporating not only grated apples, but also apple butter into the batter. 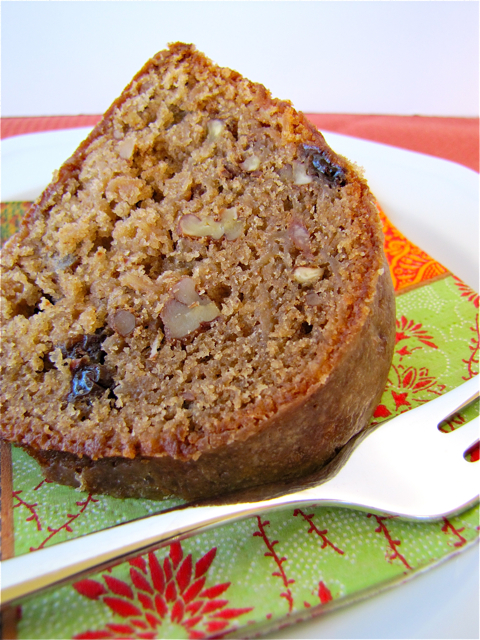 Warm spices like cinnamon, nutmeg and ginger only enhance the cake without being overpowering. 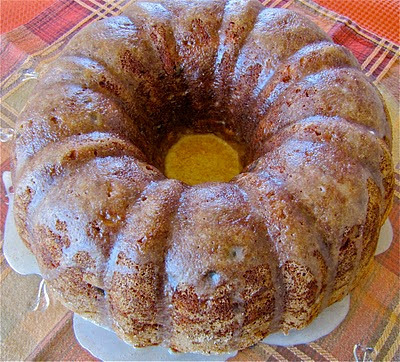 I left most of the cake as written but made a few tiny adjustments by dusting my Bundt cake pan with sugar instead of flour, soaking my raisins for about 30 minutes in a couple tablespoons of brandy before adding them to the batter, and last but not least, adding a couple of shakes of cinnamon to my glaze. This cake ended up being the epitome of fall and everyone in the family loved it, even my "cooked apple challenged" kids. Most of all, I was impressed by my "I hate raisins" teenager who exclaimed that by soaking the raisins prior to baking they weren't half bad and she wasn't forced to pick them out of the cake before eating. Now that is what I call success! One small change that I would add the next time (and there will be a next time) is to reduce the sugar by about one third. I thought the cake almost bordered on being too sweet, but that's certainly nothing that can't be fixed. Great cake that will certainly make any cup of tea or coffee just a little bit better during autumn! 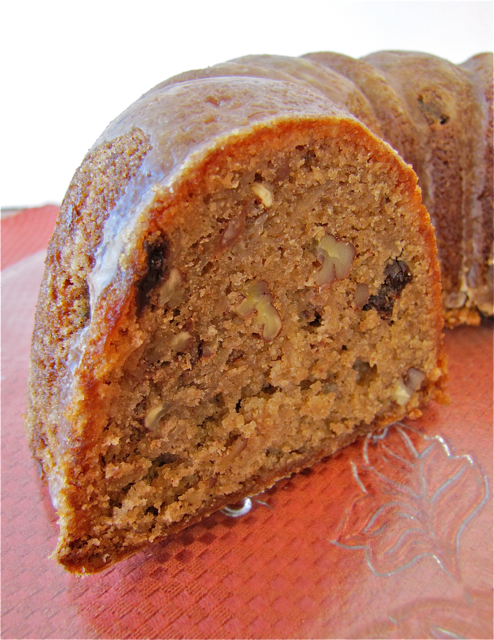 1/2 cup plump, moist raisins (dark or golden), soaked in 2 tablespoons brandy for 30 min. Center a rack in the oven and preheat the oven to 350 degrees F. Butter a 9- to 10-inch (12 cup) Bundt pan. Dust the interior of the pan with sugar, then tap out the excess. Set aside. Whisk together the flour; baking powder, baking soda, spices and salt. Working with a stand mixer; preferably fitted with a paddle attachment, or with a hand mixer in a large bowl, beat the butter and sugar on medium speed, scraping the bowl as needed, for 3 minutes, or until the mixture is smooth, thick and pale. Add the eggs one at a time, beating for about 1 minutes after each addition; you'll have a light, fluffy batter. 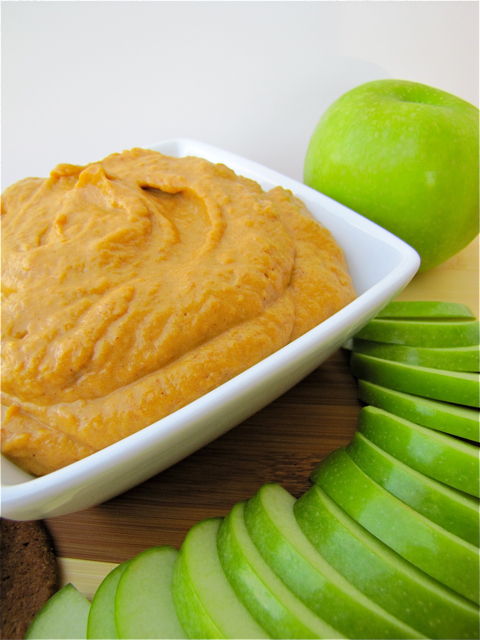 Reduce the mixer speed to low and beat in the apple butter don't' worry if it curdles the batter. Still on low, add the grated apples and mix to completely blend. Add the dry ingredients, mixing only until they disappear into the batter. Using a rubber spatula, fold in the nuts and brandy soaked raisins. Turn the batter into the Bundt pan and smooth the top of the batter with the rubber spatula. Bake for 50 to 55 minutes, or until a thin knife inserted deep into the center of the cake comes out clean. Transfer the pan to a rack to cool for 5 minutes before unmolding and cooling the cake to room temperature. If possible, once the cake completely cool, wrap well in plastic and let it stand overnight at room temperature to ripen the flavors. Ice the cake just before serving. To make the optional icing: Put the confectioners' sugar in a small bowl and stir in a squirt or two of orange juice. Keep adding the juice a little at a time until you have an icing that falls easily from the tip of a spoon. Stir in the ground cinnamon. Drizzle the icing over the top of the cake, letting it slide down the curves of the cake in whatever pattern it makes. Let the cake stand until the icing dries, a matter of minutes, before serving. I know I sound like a broken record but it is still hot in Arizona. Not "I'm melting" hot, but still hot enough that we are having a hard time recognizing it is fall by the time 3:00 pm rolls around. This is why I have decided I would just pretend it is nice and crisp outside and I started treating my meals as such. My youngest has also decided he had enough of this heat and started wearing jeans to school again, despite the fact that he is a sweaty mess by the time he arrives back home. He pointed to the calendar the other day and told me that he HAS to wear long pants after fall break because that's just what you do. Seriously, how can I argue with this logic? I found this recipe probably a little over a year ago on Tasty Kitchen and it caught my eye right away. After a little bit of tweaking the recipe, it has come to be a family favorite, especially after a long day of school and soccer practice in the evening. The chili comes together quickly and while I realize you could make this with dry beans that have been soaked and cooked, it would defeat the convenience of the recipe for me, but if that's what you like to do, I say go ahead and knock yourself out. Chicken breast is cubed and browned along with onion and garlic powder in a big pot. The drained and rinsed beans are added along with chicken broth, green chilies and spices. The mixture is simmered for about 30 minutes and for the final touch sour cream and heavy cream are added. This ensures a perfect balance of spiciness and creaminess. The soup has quite a kick, so if you like it a little milder, make sure to use less chilies or leave the cayenne pepper out. I like to serve this chili with tortilla chips and a little sprinkling of cheddar cheese, but a good cornbread on the side would be just as delicious. This is one of those meals that never has leftovers in our house and my kids fight over the last few spoons. It is also not as thick as a traditional thick chili, think of it more like a hearty soup with a kick. The spiciness of this dish will warm you nicely on a chilly evening, so make it tonight and get yourself all toasty warm! Heat oil in a large pot. Saute chicken, onion, and garlic powder until chicken is no longer pink. Add beans, broth, chilies, and seasonings. Bring to a boil. Reduce heat and simmer uncovered for 30 minutes. Remove from heat and stir in sour cream and cream. Serve garnished with cheese if desired.